In the Kuiseb Canyon near the gravel road from Windhoek to Walvis Bay, a German motorhome traveler was attacked by a leopard at night. At the beginning of April, Hardy Specker (61) and his wife Petra Windmeisser (60) parked their camper van near the Kuiseb Bridge to spend three days in the canyon. On the third night, they were woken up by a thump on the car. The two initially feared that someone wanted to break in. Hardy Specker got up and went to the small window in the kitchen to see what was going on outside. When he opened the window, a leopard jumped at him and grabbed him by the neck. The animal missed the aorta by a fraction. Instinctively, Specker later described, he pushed his fingers into the eyes of the cat. As the animal tried to pull him through the window, his wife came to his aid courageously and held him by the legs. Finally, the leopard let go of his victim, but jumped on the roof of the motorhome and stayed there for hours. He was also not driven away by the horn of the mobile. Petra Windmeisser provided first aid to her seriously injured husband by stopping the bleeding and bandaging him. Because of the leopard, she could not leave the mobile to fold in the entrance stairs and drive away. Hours later, the two were rescued by a passing motorist, who drove them in their camper to Walvis Bay, so that Windmeisser could take care of her husband all the time. The seven-hour operation was successful, Hardy Specker recovered quickly. Nevertheless, the pensioner couple broke off its planned nine-month tour through Southern Africa, shipped the camper back to Germany and returned to their hometown Constance. According to a report by German private TV channel RTL at the end of May, the wounds healed well, but scars on the head and arms were not to be missed. Experts puzzled over the unusual behavior of the leopard. Maybe the animal was raised by someone and later released in the wild. That would explain why it was not afraid of people or vehicles. Maybe the leopard was also infected with rabies. The Ministry of Environment called on travellers to be cautious and announced they would investigate the case. 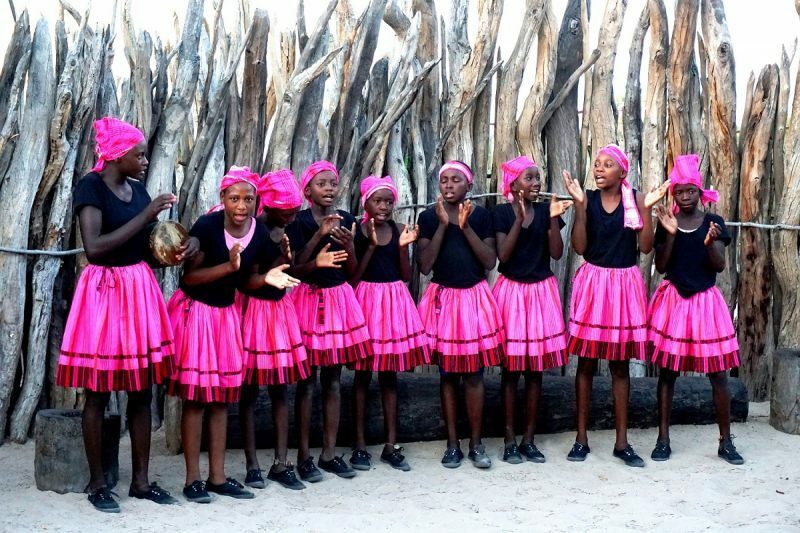 The “Ovambo Travel Pass” of Air Namibia allows to experience the culture of the people of northern Namibia. Photo: NTB. Complete news stories published in the column “Reise Aktuell” in the print edition of Namibiamagazin no. 2/2018 (in German only).